London, UK & Philadelphia, PA – 27 September 2018 – Just Play, a leading toy manufacturer, has appointed digital kids’ network & studio, WildBrain, to create new original content and exclusively manage the global YouTube channel to support the launch of Just Play’s new doll brand, Hairdorables. Under the agreement, WildBrain will help build and grow the international audience for Hairdorables through the launch of the brand’s official YouTube channel and through production and distribution of original animated and live-action content. 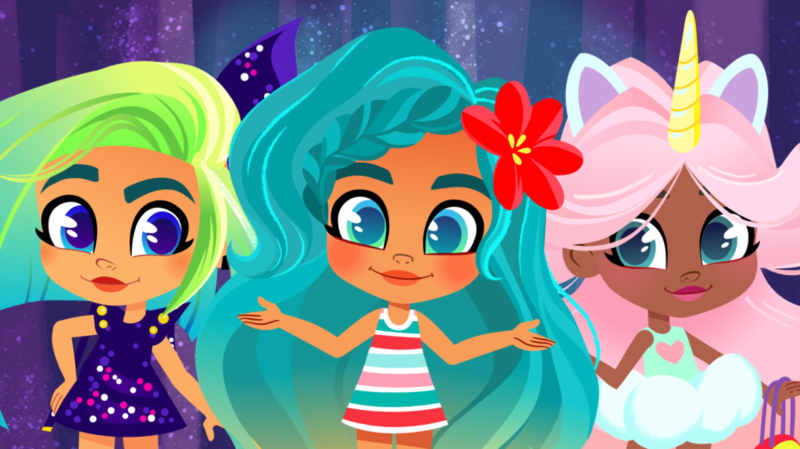 Hairdorables’ first-ever YouTube series, designed to inspire young fans and celebrate the collectible dolls, is now live on the Hairdorables channel on WildBrain’s network and the YouTube Kids’ App. There’s no such thing as a bad hair day for Noah and the Hairdorables, the popular doll line from Just Play, created for girls aged 5-8. This stylish girl squad with “Big Hair, Don’t Care” attitudes, is ready to take the internet by storm with an all-new collection of animated and live-action shorts. The English-language video series, produced by WildBrain, consists of animated vlogs to introduce each character, live-action toy play videos and an animated series about the characters’ lives and adventures. The YouTube channel aims to engage girls with the brand and inspire fans to create their own Hairdorables videos with the toys. Hairdorables arrived at major US retailers in early August, supported by a multi-platform media campaign, including National TV, Social Media, Influencer unboxings, and an unveiling event. They have seen robust sales above expectations from the start and have earned coveted spots on retailer and industry lists of top holiday toys. The products are launching internationally throughout fall of 2018 and into spring 2019. Just Play is a passionate toy company that has emerged as a global leader across a broad range of children’s consumer goods including figures, playsets, dolls, plush, role-play and dress-up. They create award-winning products based on some of today’s most popular children’s entertainment brands in partnership with best-in-class licensing partners. Just Play was founded by two toy industry veterans in 2010 and since then has become the #6 toy company in North America, according to NPD. To learn more about Just Play’s products, please visit www.justplayproducts.com or follow the company on Twitter (@JustPlayToys) or on Facebook (www.facebook.com/JustPlay).